Today is American Thanksgiving and so I thought I would like to take this opportunity to give thanks for those people who played such an important role in encouraging me on my creative journey, to finally start quilting, something I have wanted to do for a long time now. Now let me tell you , that it has taken me a long time to be able to put the word creative, next to anything associated with me, for example in my tagline. I always thought of myself as the uncreative member of my family and have always admired those members of my family who have that creative gene that seemed to have bypassed me. It wasn’t until last year, when I started to read one of Julia Cameron’s books “The Artist’s Way- A spiritual path to higher creativity”, that I realized that everyone has the ability to be creative. This book was really what kick started my creative journey and helped build my own confidence in my ability to create. But being creative was the easy part, creating something was quite another. After almost a year and a half of trying to learn to sew and 6 or 7 months more to learn to quilt, I finally finished my very first quilt. It is mindboggling when I think of all the people I have to thank for helping me. Maya and Irène are two excellent teachers, who patiently taught me how to machine sew my blocks, sashing and binding together but also were an excellent source of inspiration, with their beautiful store The Quilt Place filled with fabric and quilts I love. So thank you ladies!! 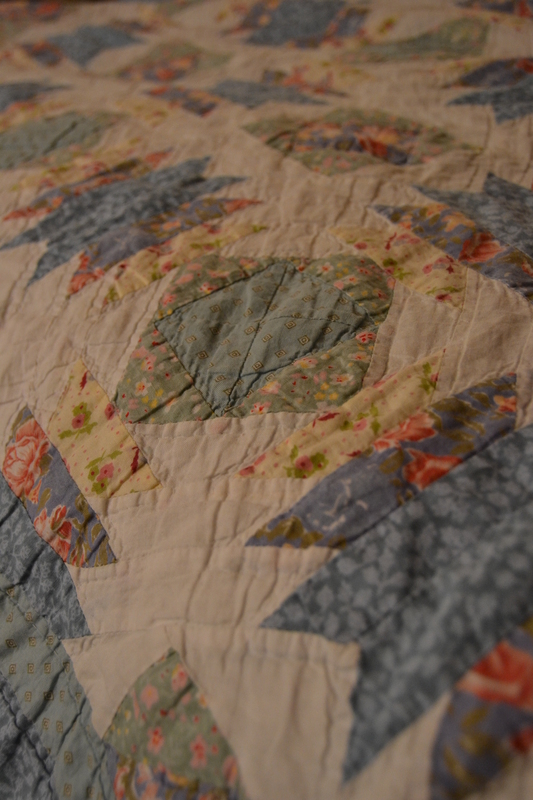 Below you will find links to the quilting websites I mention in this post. There are so many other people to whom I am thankful for all the support they have given me, especially my parents, husband, and friend Kemi who all listened to the procrastinating that it took before I finally took my first steps, and continue to listen to all my quilt jabber now that I am hooked. I especially thank Kemi, who has accompanied me on more than a few quilt shop hops, to buy fabric, notions and just indulge in looking at the things that make me happy. 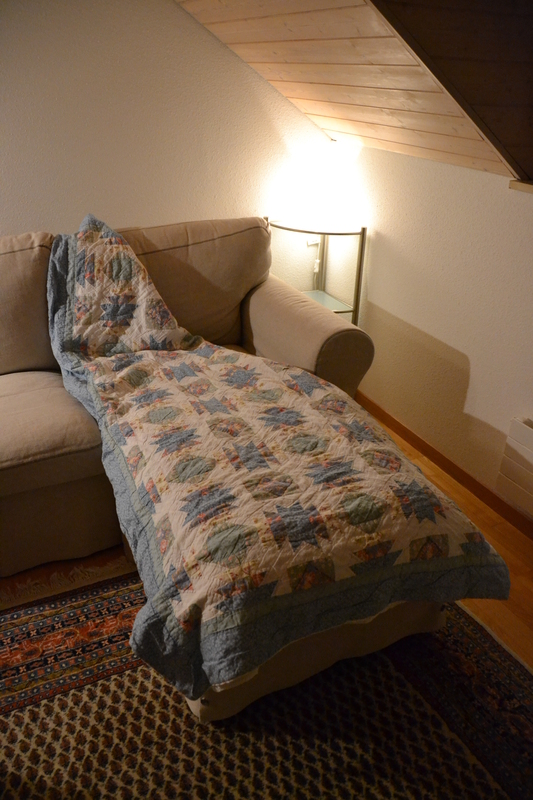 Kemi has proven to be an excellent assistant and model, when doing any “photo shoots” of quilts and inspiring places. A big thank you to Pat Sloan for her excellent podcasts on American Patchwork and Quilting Radio, these help keep me motivated while quilting. Next up, Alyssa Lichner at Pile O’ Fabric and her excellent beginners quilting tutorial series which I so wish, I had found sooner. Alyssa not only walks you through each process but links you to other amazing tutorials, just in case you need even more help. THANKS Alyssa!! Then there is “Pickel” at Swimming in brine for her tutorial on handmade, embroidered quilt labels and Jenny Hart from Sublime Stitching for her embroidery tutorials. So with that, I thank all of you quilters and bloggers out there for your contribution to the online quilting and/or creative community! And for all of you who are American, I wish you a very happy Thanksgiving! I will be thinking of you all devouring delicious Thanksgiving dinners, when I’m sitting in my German class tonight! P.S. The Quilt in these pictures is my first quilt that I owned, that inspired me to learn how to quilt myself. It may only be a department store, bought, one but I love it. Isn’t it lovely? It is certainly well loved!! !